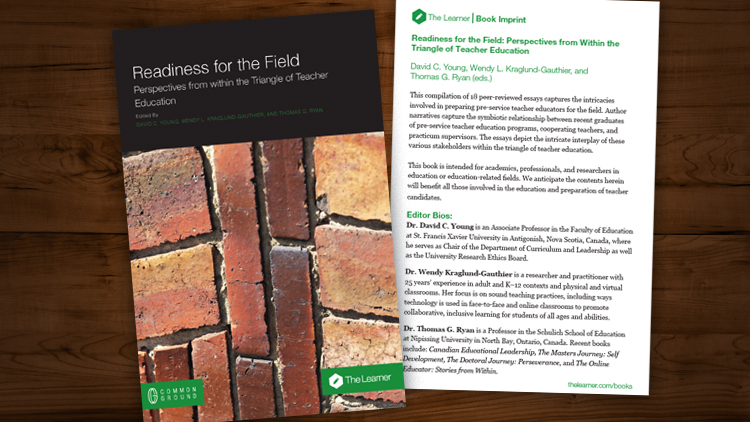 The intricacies involved in preparing pre-service teacher educators for the field is the subject of a new book, Readiness for the field: Perspectives from within the triangle of teacher education, edited by two StFX teachers, Dr. David Young and Dr. Wendy Kraglund-Gauthier. Dr. Thomas Ryan of Nipissing University is also a co-editor of the book, a compilation of 18 peer-reviewed essays, published in September 2018 by Common Ground. Dr. Young and Dr. Kraglund-Gauthier say throughout the book the focus remains on the narrative as told by new teachers and those involved in teacher preparation and supervision. “Each chapter is a personal glimpse into the practice of teacher education, where the value rests in the perspectives of the authors as they recount their experiences and research in teacher preparation programs and schools across Canada,” they say. Both Dr. Young and Dr. Kraglund-Gauthier say the book is a natural outgrowth of their roles as teachers. As a member of StFX’s Faculty of Education and Chair of the Department of Curriculum and Leadership, teacher preparation is the cornerstone of what Dr. Young does. This is Dr. Young’s third book. His first book was Teaching online: Stories from within, which was published in 2014. His second book, published in 2017, was Education law in Canada: A guide for teachers and administrators. This is Dr. Kraglund-Gauthier’s first book. Dr. Young’s research is focused on the broad topic of educational administration and policy. More particularly, his current writing deals with issues surrounding law and education. His work has appeared in a wide variety of publications including Capsle Comments, the Education & Law Journal, the Canadian Journal of Educational Administration and Policy, and the Journal of Educational Administration and Foundations. Dr. Kraglund-Gauthier’s research focuses on accessible learning in face-to-face and digital spaces. Her work has appeared in a variety of publications including articles in Transformative Dialogues, Journal of Educational Administration and Foundations, and the Canadian Journal for the Scholarship of Teaching and Learning, and chapters in Emerald’s Innovations in Higher Education Teaching and Learning series and Springer’s Handbook of mobile teaching and learning.